PROS meets on Wednesdays from 6:30pm to 8:30pm at the McVay Family Center. A meal is served to the youth at the McVay Family Center at 6:30pm. To make an online secure donation to our PROS youth ministry click below. 1. 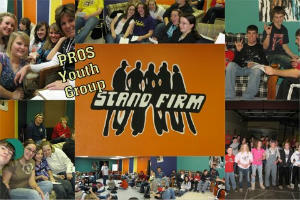 Small groups are an important part of our youth ministry. Although we do meet together each week and host several events which are open to all students, small groups are where activities, mission, deep discussion, student leadership, retreats, and outreach happen. 2. At PROS, all students can expect to be acting upon what we learn in tangible and cooperative ways. We take seriously the concepts of serving others. God calls, and we respond..together. 3. Students are our leaders. We recognize that each student is gifted differently, and we seek to integrate these gifts into what we do. Our adults are some of the best Christian coaches anywhere, but our students actively help steer our course. Click here for more information about Confirmation at New Sharon United Methodist Church.